When bustling Bottega Louie announced plans to expand in Downtown Los Angeles; they knew there was no better development consultant to advise them with their expansion in downtown than Hamid Behdad and CCDG. With expertise in city codes, permitting process and with a myriad of professional relationships developed over a lustrous career, Mr. Behdad is a magic man when it comes to renovation and development. 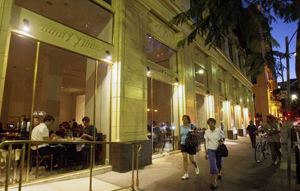 Below is a write up in the Los Angeles Times about Bottega Louie and their expansionary vision. Bottega Louie rents space in a historic office building across 7th Street for a kitchen, tasting room, training facilities and offices. September 25, 2013, 5:12 p.m.
One of the pioneers behind a lively strip of new bars and restaurants in downtown Los Angeles has launched plans to expand. The owners of busy Bottega Louie restaurant — known for its vast menu, long waits, tasty pastries and deafening crowds — have rented quarters in a historic office building across 7th Street. They are adding a kitchen, tasting room, training facilities and headquarters offices. The move is part of an accelerating expansion of bars, restaurants and residences along 7th Street, which was once a key shopping boulevard but fell moribund in the closing decades of the 20th century as much of downtown decayed outside of the financial district. Downtown has since evolved into a more around-the-clock neighborhood, but much of 7th Street was idle when Bottega Louie re-illuminated the corner of 7th and Grand Avenue in 2009. It took over an expansive space that clothier Brooks Bros. fled years before in the bottom of an empty office tower built in 1912. Now the former offices upstairs are upscale apartments called the Brockman Lofts, where tenants pay as much as $8,000 a month for a two-bedroom unit. Other restaurants and bars such as Mo-Chica, Mas Malo, Coco Laurent and Sugarfish have opened on 7th Street, and hundreds of apartments have been built or are under construction nearby. Another trailblazer was bar operator Cedd Moses, who opened Seven Grand Whiskey Bar across the street in 2007. “It’s at the virtual epicenter of different districts — the historic core, South Park, the jewelry district and the financial district,” said real estate broker Adam Tischer of Colliers International. But in the late 2000s, it was not much of a culinary destination. Splashy Bottega Louie with its expensive crown molding and marble floors “looked like a pioneer who was going to get slaughtered,” Tischer said. Now the business is growing. Tischer helped Bottega Louie rent nearly 20,000 square feet in the former Union Oil headquarters at 617 W. 7th St., about a block from the restaurant. Terms of the 15-year lease with landlord Swig Co. were not disclosed but space in the building rents for about $2.50 per square foot per month, according to real estate data provider CoStar, and the estimated value of the deal is about $8 million. “This provides us an opportunity to bring our corporate staff and kitchen close to our restaurant and guests,” Bottega Louie Chief Executive John Herman said. The new food preparation facilities in the basement of the building are triple the size of the current ones about three miles away, he said. It will be there that the restaurant’s signature macarons, pastries and mousses will be prepared. Also set to be incorporated in the new space is a fulfillment center for the Internet store Bottega Louie intends to launch this year. Bottega Louie has about 350 employees and serves about 15,000 guests a week in its dining room and adjoining gourmet market, Herman said. Its goal is to roll out other Bottega Louies in other cities over the next decade, but the private company is moving cautiously and doesn’t expect to open another restaurant until 2015. The current location is busy enough not to accept reservations, and the crowd can create a memorable din. Last year, the restaurant installed sound-absorbing materials under its chairs and banquettes, and trained servers to avoid juggling armfuls of clanking plates, but the buzz is still pronounced. Noise isn’t all bad as far as Herman is concerned. “When a restaurant is full, it has a lot of energy to it,” he said. The clamor and crowds waiting for tables apparently work well for Bottega Louie, said restaurant consultant Randall Hiatt, president of Fessel International Inc.